“The Day After Tomorrow” is the culmination of a curatorial workshop in which artists are involved in a collective curatorial experiment. The exhibition features works from thirty-seven emerging artists from Parsons’ BFA program. Through various mediums — from painting to electronic installations and mixed-media — the works in this exhibition can be seen as individual, sometimes introspective, speculations about the (in)tangible future. Engaging with ideas of nostalgia, futurology, dystopia and the personal, the works convey a complex combination of feelings towards the not-so-far and yet unreachable “day after tomorrow”, towards the possibilities and impossibilities of today. 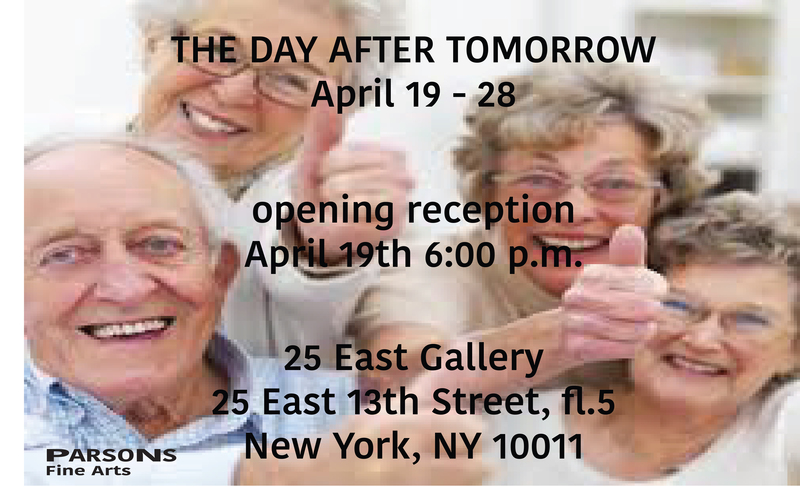 An opening reception will take place on April 19th, 2016 from 6pm to 8pm at the 25 East Gallery, located at Parsons The New School for Design. Exhibition will run through April 28th. L, N, Q, R, 4, 5, 6 Trains to Union Sq. 1, 2, 3 Trains to 14th Street and 6th Ave.